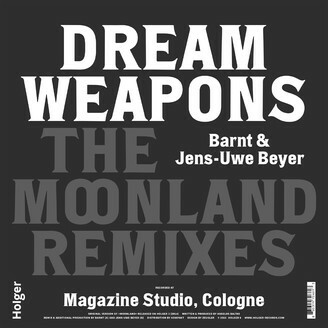 Dream Weapons’ »Moonland« from his »Pathways EP« (Holger 3, 2014) has been a favorite of many. Accordingly, remix duties were given into the trustworthy hands of Barnt and Jens-Uwe Beyer – two of the co-founders of much acclaimed Cologne label Magazine. An expert in mixing and structuring, Barnt carves out the hidden capabilities of the original while Jens-Uwe Beyer takes a slightly more humorous but no less feet-moving approach to things. Weirdo techno in typical Magazine/Holger style.